Milliard Net Pots are designed to give your plants room to grow... down below. Did you know that a plant's roots are as expansive as its branches and leaves? Give them room to breathe! The net pots' slotted mesh sides and bottom allow air to dry out exposed roots, which keeps them naturally pruned to prevent circling and tangling. It also allows excess water to drain away so your plant doesn't drown in a little too much love from the watering can. Place some hard-packed soil in a net pot, plant your seeds, and watch them grow! Milliard Net Pots are well suited for use with various hydroponic systems, or you can just place one in a drip tray and let your plant bask on your windowsill. When your plant outgrows it, you can upgrade to a larger size net pot, and reuse the old one! The thick, durable plastic is well suited for easy washing and many repeated uses. Milliard net pots are produced with healthy plants in mind and their durable construction should provide years of satisfaction with proper use. Designed with slotted vented sides and a reinforced top rim to promote more efficient plant growth through aeration. Provides proper drainage to encourage healthy root development and a tapered bottom for easy fitting or removal of plants or pots. When a plant becomes too big for a solid pot, the roots begin to circle and choke each other. More airflow to the root zone prunes the root structure and prevents circling. 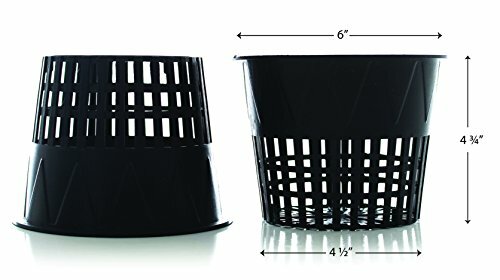 The net pots allow water to drain through, so you can use them with your favorite drip or watering system. Pack of 20 6 in. Net pots. If you have any questions about this product by Milliard, contact us by completing and submitting the form below. If you are looking for a specif part number, please include it with your message.